LEO COPERS (° 1947, Ghent) is mostly known for his sculptures, installations and performances, and has since the beginning of his artistic practice obtained a unique place in the Belgian art scene. Stubbornly he reintroduced metaphors and symbols into a visually conceptual practice. Using antagonistic objects, in surreal and alienating combinations, he aims at creating tensions, both figuratively and literally. The objects or installations are on (and often over) the edge of being dangerous and destructive and challenge our expectations. Water, fire and electricity for example are often connected in a way that makes us cringe with fear while being moved by its poetic beauty. On the verge of danger, on the edge of life. The material result and its effect on the audience is superior to the mere thought process behind the work, thus leaving behind the sterile, uninvolved conceptual art of his peers. His work can be seen as a link between the minimalist visual language of his generation, fluxus and the Belgian legacy of anti-establishment irony and poetic surrealism. In 2018 the leading Belgian art institutes S.M.A.K. Ghent, M HKA Antwerp, Middelheimmuseum Antwerp and BOZAR Brussels, celebrated Leo Coper’s 50th anniversary as an artist with unique solo exhibitions and the publication of a new book ‘Leo Copers, Dreams are made of this’, the most detailed overview of his work so far. Peter Land & Leo Copers will be part of the NICC group show "Si Tout Est Sculpture, Pourquoi Faire de la Sculpture? ", curated by Guillaume Bijl at 'De Tempel' of The Royal Academy of Fine Arts, Antwerp. 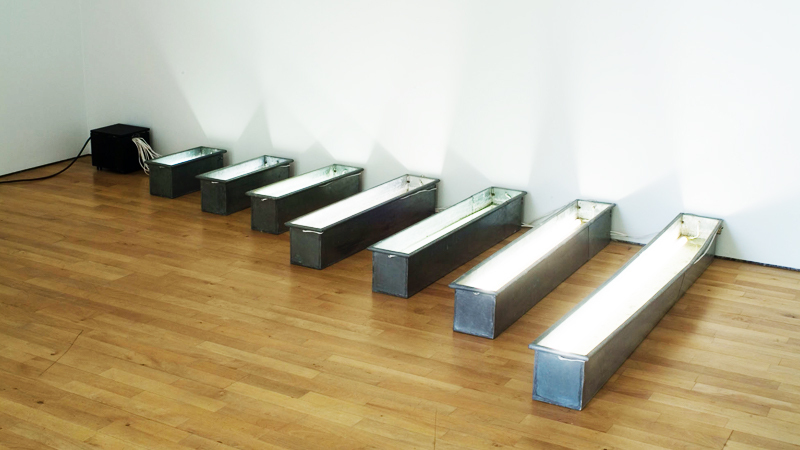 Leo Copers will show a new installation in the group exhibition 'Feast of Fools. Bruegel Rediscovered' at Kasteel van Gaasbeek, Belgium. Leo Copers (1947) vierde in 2018 zijn vijftigjarige carrière met tentoonstellingen in S.M.A.K., Bozar en Middelheim. Zijn werk ademt verwondering, gevaar, poëzie … (Wie herinnert zich niet Zeestuk met vuur, indrukwekkend in Cc Strombeek gepresenteerd in de context van Art Eco in 2014?) In het feestjaar 2019 hijst Leo Copers een vlag boven het cultuurcentrum.